Where Have All The Single Eyeshadows Gone? The other day when flipping through eyeshadow palettes like I would CDs circa 1997 to find what I was going to wear that day. Then it dawned on me - does anyone even use single eyeshadows anymore? Now I'm not talking eyeshadow pans that are put in a magnetic palette because that's just cheating. But eyeshadows that are singular in their own compact. Casting my mind back 5 years that was what my entire eyeshadow collection consisted of, albiet much smaller. Fast forward to 2016 and I have 15+ eyeshadow palettes! How did that happen? It makes sense... but gone are the days I treasured a single eyeshadow that much I 'hit pan', and I didn't even realise until 15 eyeshadows palettes in! Okay, so I may be a little drama llama about it but I guess the survivors of the eyeshadow palette takeover should be celebrated, hence this post! I want to know which single eyeshadows you still love and use, and possible would even re-purchase. Now I do have a nice collection of the Maybelline Color Tattoo shadows, but again I feel that's cheating because they are cream shadows and I can't see cream eyeshadow palettes taking off anytime soon. The same goes with loose pigment eyeshadow. So I'm left with two measly eyeshadows! 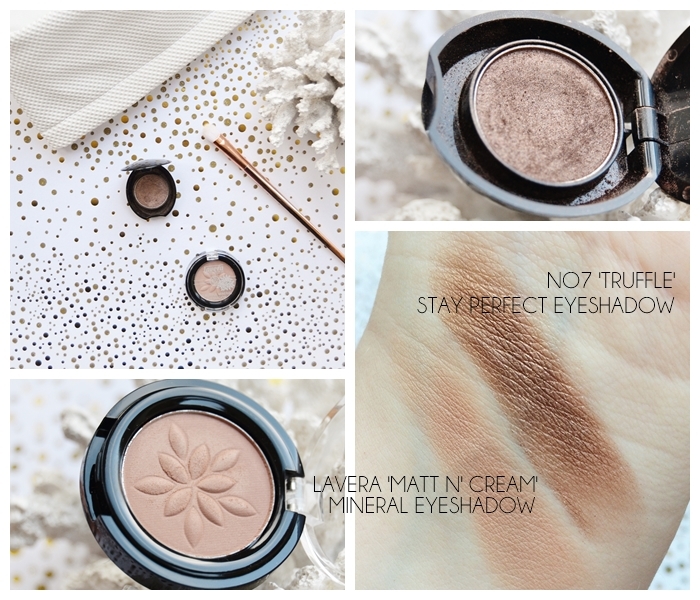 Let me introduce to you No7 Stay Perfect Eyeshadow in Truffle £7.00 HERE which strangely feels nostalgic even though I use it semi regular and it can be picked up in any Boots store... I think. This mid brown shimmer is buttery smooth and reminds me of a much higher end eyeshadow. I generally get this out after I've created a neutral smokey eye and want to add some depth and shimmer in there. If I didn't own so many eyeshadow palettes I would definitely look at more single eyeshadows from No7! I also have a rather lovely all over the lid kinda' shadow with Lavera Matt n' Cream £8.40 HERE. For some reason I never expected much from this eyeshadow as it's just a light brown shade. But this matte is a perfect base colour and blends amazingly well. The formula isn't powdery so no fall out and it's just a wonderful all over wash of colour to use. Of course single eyeshadows are no more popular in pan format as they can be placed into a magnetic palette to create something bespoke. So it would be unfair to say I've lost interest with single eyeshadows as just this past month I've tried Makeup Geek eyeshadows and started off my collection which includes so many amazingly pigmented shades, but more on that in the new year! I'd love to know if you still own and use any single eyeshadow compacts, and if so what are they? With eyeshadow palettes ruling I guess the single eyeshadows that survive in our collection have to be pretty special!